Express your love to your special someone by making coffee bold and foamy with the use of coffee maker with a steamer. The innovative steam wand included in these coffee machines allow you to froth milk to perfection to create exceptional drinks like lattes and cappuccinos assuming you have a basic way of making espresso at home. A wide variety steam wand coffee machines are available these days due to the popularity of the Aeropress, Bialetti Moka Pot, and Nespresso machines but make sure to choose a model that is versatile with modern design and awesome features. Check out these two top of the line coffee makers with integrated steamer wands. 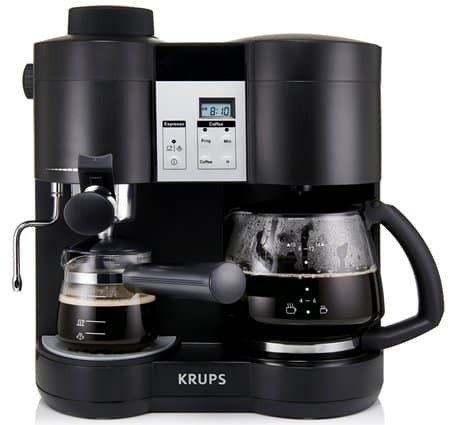 KRUPS XP1600 Coffee Maker and Espresso Machine Combination, BlackThis is a pretty affordable machine that will either make you 10-cups of drip coffee or make you four cups of 4-bar steam espresso! In recent years single serve coffee and espresso machines that use pods have become popular but this machine does things pretty good, just like coffee was made back in 2005! For the espresso lovers you can use the built in steam wand too – no more needing lots of different one-trick pony devices in your kitchen. The KRUPS XP1600 Coffee Maker and Espresso Machine Combination is a 2-in-1 coffee maker and espresso machine. 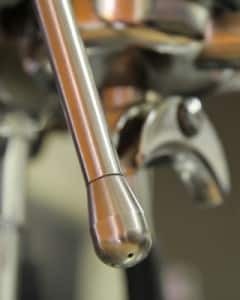 It has a convenient steam nozzle used for frothing milk to give you that elegant great tasting coffee. It has 10 cup capacity and you can set the strength and the clock with its programmability feature. It also has a keep warm function that keeps your coffee hot for 2 hours. You can even make your specialty drink at home with the 4 cups, 4 bar system espresso machine. This coffee maker has a modern design that offers precision, ingenuity and unwavering craftsmanship. 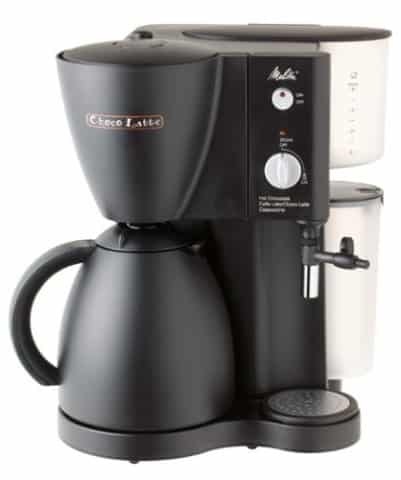 Melitta MECM1B Choco Latte Coffee Maker, Milk FrotherLatte, cappuccino, mocha Java, hot cocoa or brewed coffee, name it the Melitta Choco Latte Coffee Maker, Milk Frother can help you create all these and more. More than just a coffee maker, this incredible coffee machine can provide you any specialty drink you want. The 8 cup thermal carafe keeps freshly made coffee warm, ready for serving any time. It also comes with integrated automatic frother that gives your drink a frothy texture. This unit also includes a removable water reservoir and a reusable milk pitcher. You have to check out this coffee maker and be surprise for more amazing features. If you are anything like me you like having regular coffee sometimes and having espresso other times. If you like espresso then you probably like to make espresso based drinks from time to time like lattes and cappuccinos. In my home we regularly use Nespresso machines to make quick and basic espresso shots but I don’t like busting out a dedicated steamer or milk frother to make my milk foam. We also periodically use the large stovetop espresso maker to make a bunch of espresso like coffee when guests come over then use the steam wand on the regular coffee pot to whip up lattes and other similar drinks. This coffee maker style, the kinds that have built in steamers make it super simple to get steamed milk with little to no hassle. Many of them also are pretty good steam espresso makers too. They just take a few more steps to get espresso than a pod espresso maker does. Should You Get A Dedicated Milk Steamer Instead? The obvious two alternatives to this coffee machine setup is to either pick up a real espresso machine that typically includes built in steamers to steam and froth your milk. This option however is usually quite expensive and redundant if you frequently make alternative espresso from your stove or hand powered pressure brewing devices. The second alternative is to buy a dedicated milk frother which can work well. They don’t usually cost very much but on the high end they can take a bite of your budget still. Unfortunately the cheaper milk frothing tools don’t produce the greatest froth with the tightest micro-foam (bubbles) so it’s not the best option for everyone. Even still it’s worth looking into because the steamer wands on coffee makers do take up a lot of counter space and they do cost more than regular drip coffee makers.